Talmud Torah k'negged kulam - study of Torah is among the highest of our Jewish religious obligations. Our Torah scrolls are at the heart of our identity as a Jewish community, and it is our obligation to care for them. This is the case with all of our Torah scrolls, but particularly with our Czech scroll, which survived the Holocaust, and which has been entrusted to us to preserve the legacy of a community that was destroyed. 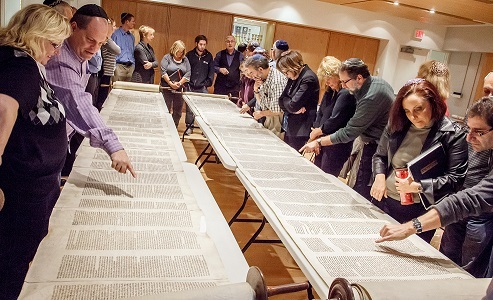 The restoration of a Torah scroll is not only the fulfillment of a communal obligation; it is an opportunity for learning and spiritual growth for the entire congregation. To this end, we are pleased to be able to engage the noted Sofer (Scribe) Neil Yerman to participate with our congregation in a process of education and Torah restoration. Throughout 5774, Sofer Yerman will visit our congregation a number of times, to provide learning opportunities for every member – young and old - and to perform the necessary restoration work on our Torah scrolls. Thank you to our Kol Kodesh supporters! and in memory of Karen's father, Harvey Hecker. Dan & Betty Mair, in memory of Dan's father, Berel Mair. Eva & Marleine Kay and Alan Levin, in honour of Eva Kay's 88th Birthday, in memory of Rachel & Max Bernstein, in memory of Cecil Levin and Carly Levin.